My Blog: Winter, eh... Spring Wonderland?! I haven't been working all that much lately and as it always happens, on the one evening I have a shift; of course, it snows! I do drive a distance to work, so thank goodness traffic was down to a minimum; because lately, due to financial reasons, the county and the state hold back on snow plowing! Go figure. But as soon as I arrived home after midnight, I just reached for my camera to take a few pictures. I felt as if I was in a snow globe after taking the above picture. 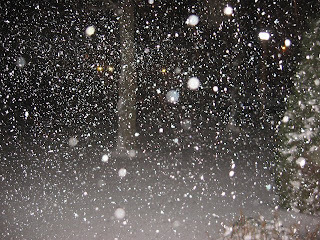 Check out those massive snowflakes. 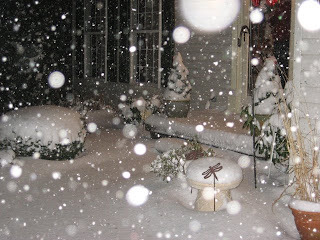 Above, is a picture of my front step and I'm sure Martha would be happy to see the gentle dusting of snow that was left there - of course to give the house a warm, cozy feeling. I'm sorry, I'm just excited for the late snow. We haven't seen much this year and I just want to say, there is a light, literally, at the end of the tunnel - in a week, DAY LIGHT SAVINGS time will start again! So summer is just around the corner. 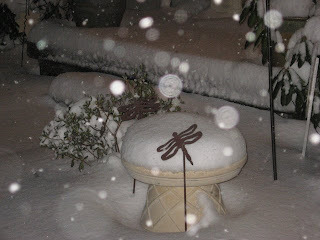 Just a close up of the inches of snow that has accumulated on my little make shift bird bath. So now it's early in the morning here on the Eastern Coast of the US and I'm going to put on my snow boots and actually take a little walk around the community. I'm starting to show my age; because, I just love the peace and solitude that the snow fall brings to a normally bustling area. It looks all winter wonderlandy here in Delaware too this morning! And it's still coming down hard. I love when it snows this much!